Robert has won over 80 awards in his painting career. Notably, he is a two-time Best-of-Show winner at the Hoosier Salon Annual Exhibits (2003 and 2011), Southside Art League 7-State Regional Shows (1999 and 2004) and New Harmony’s First Brush of Spring (2002 and 2009). He has been awarded top prizes in each of the major art competitions in Indiana. 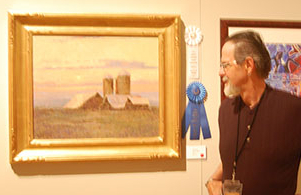 Robert was honored as one of six Indiana artists in the “Master Artists of Indiana” show at the Hoosier Salon New Harmony gallery October, 2010. At the opening reception, he and Bill Borden, Judith Lewis, Ronald Mack, Les Miley and Jerry Smith were presented with crystal statuettes by show sponsor Dr. George Rapp.